Tribune Chronicle / Bob Coupland The Butterflies and Hope Memorial Foundation donated $4,000 to the Trumbull County Family and Children First Council that will be used to sponsor trauma training March 30. From left are April Caraway, executive director of the Trumbull County Mental Health and Recovery Board; Margie Alexander, council coordinator; Dr. Ronald Dwinnells, founder of the foundation; and Ed Stark, council chairman. 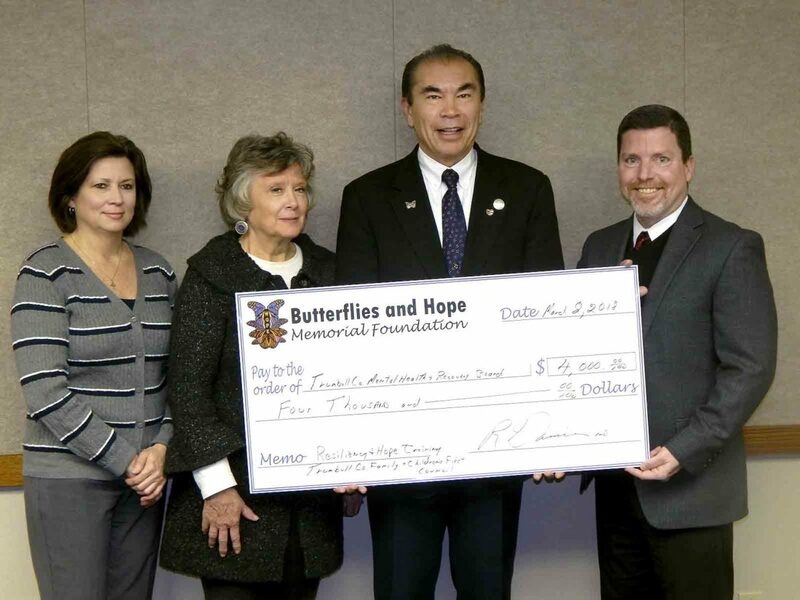 WARREN — The Butterflies and Hope Memorial Foundation has given $4,000 to the Trumbull County Family and Children First Council and the Trumbull County Mental Health and Recovery Board to sponsor an upcoming trauma training program in the county. Dr. Ronald Dwinnells, founder of the foundation, said in his 35-year career as a physician, he has known many people with mental illness and behavioral health issues, such as alcohol and drug addiction. He said his father battled severe depression and took his own life and his mother suffered from paranoia and delusions and later developed Alzhiemers. “Much of the mental illness and behavioral health issues are preventable and manageable. However, the sad news is the current governmental health legislation and polices and health insurance programs provide relatively little financial support to these illnessess and conditions,” Dwinnells said. Dwinnells said education is important and the nonprofit foundation aims to support mental and behavioral health programs that focus on prevention, advocacy and research to help children and adults. The training program will be for community educators, social and behavioral counselors and health care providers to address emotional and behavioral trauma. Megan Kovacich, marketing director One Health Ohio, said the council and recovery board are working together to address the issue. “Trauma care is something both organizations are working on in the community,” she said. Margie Alexander, council coordinator, said the recovery board is the administrative agent for the council, which is hosting the training. Alexander said One Health Ohio has representatives on the trauma informed care training committee. She said 70 people are registered for the daylong training, which will address the question of how to address a trauma responsive community.